US 60 formerly continued ahead, connecting with Atlantic Av on the other side, crossing Rudee Inlet via a bridge that no longer exists. This first bridge was considerably closer to the shoreline than today's bridge, and apparently there were issues keeping it open to traffic... which is not surprising, considering the risk of impact from beach erosion. 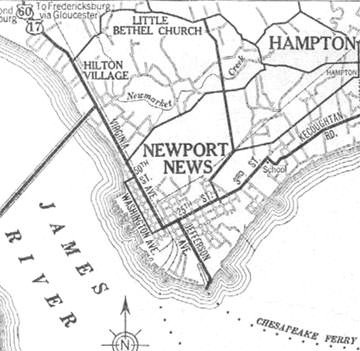 Commonwealth Transportation Board (CTB) minutes from 1938 and 1941 include references to "...the situation at Rudee Inlet..." and discussions about "...a seawall to sustain the road..." ​Whatever solutions were tried, apparently they were not successful: maps from multiple sources (e.g. USGS, Princess Anne County, City of VA Beach) indicate that this first bridge was already gone by the early 1940s. The road shown at lower right is South Atlantic Av, which carried US 60 to Camp Pendleton until the first bridge was abandoned around 1940. 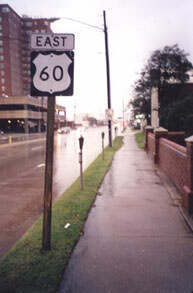 In other words, US 60 initially ran along the shoreline, to the east of Lake Wesley. But since then, it appears that all subsequent bridges have carried traffic to the west side of Lake Wesley. If the first bridge no longer existed, then obviously US 60 could not have been routed along S. Atlantic. So then where did it end? 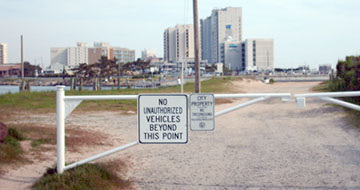 "...the portion of US Route 60 at Rudee Inlet, between the face of the north and south walls of the abutments, a distance of 200 feet, being no longer necessary for uses as a highway, be abandoned altogether as a public road... and that the remaining portion of Route 60 beginning at the south abutment and extending south to the present end of maintenance, a distance of 0.763 mile, be transferred from the Primary System to the Secondary System of Highways..."
In other words, the first bridge was removed from the highway system; the US 60 designation was officially truncated to the location where it had actually ended for the previous 20 years (on the north side of Rudee Inlet); and the former stretch of US 60 south of Rudee (along S. Atlantic Av.) became a secondary route. 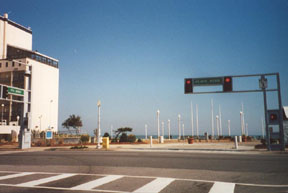 "Beginning at Rudee Inlet; thence northerly along Atlantic Avenue, westerly along 17th Street, northerly along Pacific Avenue and Atlantic Avenue, and westerly along Shore Drive to the W.C.L. of Virginia Beach..."
"Beginning at its intersection with U. S. Route 60 at 17th Street; thence northerly along Atlantic Avenue to its intersection with Pacific Avenue (U.S. Route 60)..."
"The major intersections in VA Beach were well-marked. Eastbound US 60 split into mainline US 60 (Pacific Av) and Business US 60 (Atlantic Av). This division was well-marked, using the then-typical small Virginia cut-out US shields on wooden posts. 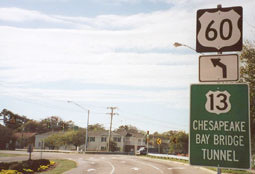 Both routes were marked with reassurance shields south to Laskin Road (where US 58 ended) and continuing down to VA Beach Blvd, which was marked "Business US 58". No "End" signs anywhere, but the proper directional signs were posted for US 58 and US 60 and their respective business routes." So, what's the problem? 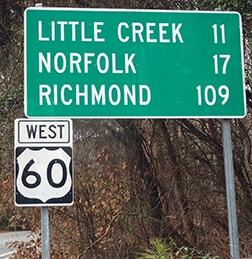 Why isn't VDoT's data more current? Is it because independent cities are supposed to report to VDoT any changes they make to highway routes, but VA Beach has not done so? Is it because VDoT does not consider it a high priority to keep data for independent cities accurate? Are there other reasons? 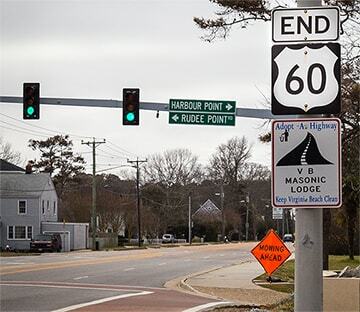 I don't have the answers, but I do know that there are several instances (not just in VA Beach) where discrepancies exist between VDoT's route logs and highway signage posted in the field. 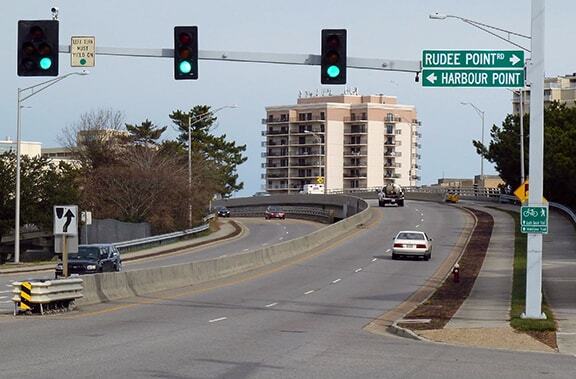 However, the problem is compounded in VA Beach, because the City has almost completely failed in its responsibility to keep its highway routes clearly signed. Not far behind that sign, Atlantic becomes Pacific. If one wants to continue south on Atlantic, they must make a left turn at about the 4100 block. That is the north beginning of Business 60 (or at least it was), but there were no signs to that effect. Further south, there were no signs for US 58 at Laskin, or Business US 58 at 17th, nor any indication that US 60 traffic should turn on 17th in order to resume southward along Atlantic. So this is a case in which an independent city has made changes to a highway route within its jurisdiction. Since this change has never been reflected in CTB minutes or in VDoT records, it appears that either VA Beach did not report the change to the state, or else the state agencies have not bothered to update their info. 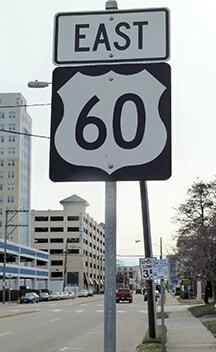 Whatever the reasons for the discrepancy, another resulting complication is that VDoT has never petitioned AASHTO to approve this change in the route of US 60. Virginia's unusual relationship between its DOT and its independent cities has resulted in a situation fraught with problems, including unreliable route logs and unacceptably dismal route signage within several cities.